If your organisation runs an ID card printer, then you will need a steady supply of Plastic ID Cards. 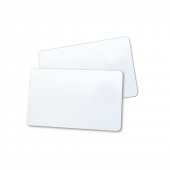 All cards come blank on both sides and can be used to identify staff, visitors and contractors on your site, or used as membership, reward or loyalty cards. We pass on savings to you by offering plastic identity cards in great value packs. We also stock a wide range of id solutions for your organisation.